The Pacific Ocean is the largest of the world's five oceans, followed by the Atlantic, Indian, Southern and Artic Oceans. Each one of these oceans is under threat from solution and changing climate conditions. Conservation of these oceans is one of our most important responsibilities so future generations can appreciate the huge variety of fish and mammal species living in the seas today. 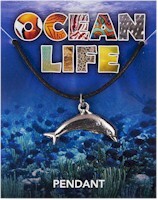 This dolphin is made from lead-free pewter and is supplied on a waxed cord. The information on the fold-over card describes about the threat to our Oceans and how important conservation is to their future. A penguin made from pewter, supplied on a waxed cord. The information on the fold-over card describes about the threat to our Oceans and how important conservation is to their future. An octopus made from pewter, supplied on a pin with clasp. The information on the fold-over card describes about the threat to our Oceans and how important conservation is to their future. Seahorse in pewter supplied on a key chain. A turtle made from pewter, supplied on a pin with clasp. The information on the fold-over card describes about the threat to our Oceans and how important conservation is to their future.